Steven Armal tossed a couple of live mealworms into his mouth, chewed aggressively, opened his empty mouth wide, and then chased the critters with a bite from a nearby sugar cookie. Not your typical Saturday morning crowd. Three hundred and twenty teams of two took to the streets of San Diego Saturday to compete in City Chase, a six-hour racecourse designed to test even the most daring participants with a series of physical and mental challenges across the city. The best way to describe it is a mashup of a scavenger hunt. 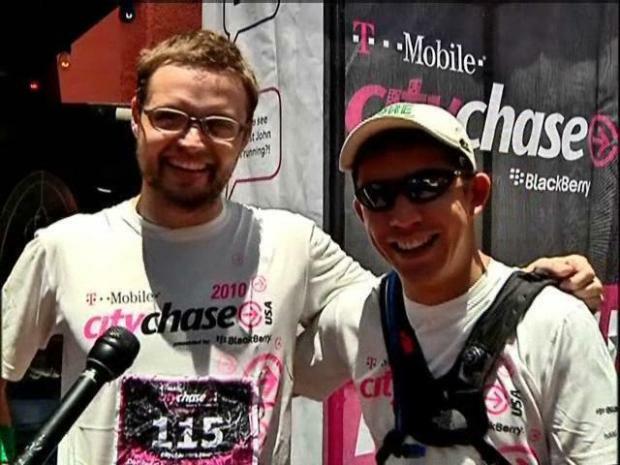 Images: City Chase San Diego 2010. Email your photos to isee@nbcsandiego.com. After running around town there's no better way to enjoy a victory than with a drink. The stakes were raised at the event, which was making its third annual stop in San Diego. San Diego proved up to the challenge. Hunderds of adventure seekers came out to cause mayhem around the San Diego. Beginning at 10 a.m. with a good stretch at Tuna Harbor Park, racers decoded challenge locations from a provided clue sheet. Upon arriving at a challenge site, teams could elect to pursue the awaiting challenge or move on to another. Each completed challenge was worth one ChasePoint. Ten ChasePoints were needed to cross the finish line at the Double Deuce bar on F Street. Among the 22 clues, one read: “Across from SAN where we tribute Survivors' fight for health, this challenge will take ability, balance and stealth.” For that task, racers, who were limited to traveling by foot or public transportation, competed in a jousting match at Cancer Survivors Park, located on Harbor Dr. across from Lindbergh Field. One lucky couple got to participate in City Chase and liked their chances to win. Making their way from a task at San Diego City College, engaged high school sweethearts Robert Guzman and Gwen Nuño used the No. 7 bus to get to The Flame on Park Blvd. in Hillcrest. Little did they know what was awaiting them inside the dimly lit dance bar. Wearing black stilettos, black shorts and a black tank-top that fittingly read “Got Pole?” in white lettering, a professional in-home pole dancing instructor named Kitty was ready to teach City Chase her ways. Only one representative of each team needed to complete the pole-dancing challenge, so Guzman supported his future bride from the sidelines. With Usher's song “Yeah!” blaring in the background, the two seemed to adapt to their surroundings. Nuño learned to “body wave” while Guzman clapped and cheered “Yeah!” behind her. Afterward, the couple, who will have been together for 10 years as of their wedding day this November, was all smiles about its City Chase experience. Of course, every race must have its winner. This year, Tyler Runner and Andy Almonte were it. Runner, an Oregon resident, and Almonte, from Colorado, rendezvoused in San Diego specifically for the event. The former high school schoolmates arrived at Double Deuce in two hours and 48 minutes. Thanks to some help from Runner's wife, Leah, who helped navigate the winners through the urban course from a home computer, Runner and Almonte will compete in a national championship. They'll face the victors of the seven other City Chase races in the country in hopes of winning a 2011 Mitsubishi Outlander Sport. Before leaving San Diego, the champions first had some advice to impart on those considering to participate next year.